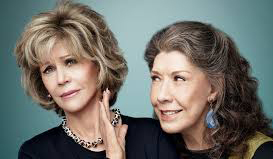 Not since the movie “9 to 5” have we seen the combined comic genius of Jane Fonda and Lily Tomlin. That was 35 years ago, and the core of that comedy centered on them battling sexism. I recently watched the third episode of their new comedy series “Grace and Frankie” streaming on Netflix. Now they are facing ageism. It’s wonderful to see these two talented women continuing to work their craft and especially heartening to see them using it to explore some of the issues adults face as they grow older. It’s a funny and irreverent take on what’s happening all around us. In this episode, the women are fighting against the way society tends to render them invisible. Both women, newly separated from their husbands, they find themselves struggling with an identity crisis. When Grace can’t get her old job back and she finds that her face no longer appears on the packaging from the business she once owned, she laments, “I’ve been erased.” When her daughters don’t have time for her, she asks one of them, “am I irrelevant?” Meantime, Frankie applies for a job teaching art at a nursing home and is mistaken for a new resident. In disbelief, she yells “I am young!” and runs out. They reach the breaking point when they go to a store for cigarettes and despite repeatedly asking for help, can’t get anyone’s attention. The young man running the store completely ignores them while fawning over a beautiful 20-something-year-old female customer. Aggravated and indignant, Grace—who is typically reserved and dignified—starts banging her grocery basket on the counter and screams, “Do you not see me? Do I not exist? Do you think it’s all right to ignore us just because…” and turns to point to Frankie, “…she’s got gray hair?” Seeing her friend go into a complete meltdown, Frankie quickly pulls Grace out of the store. This program blends humor with a refreshing and rare look at some of the issues facing adults and particularly women as they age. It’s a half hour of laughter and insights into what we may deal with every day. If you want a fun and relevant viewing experience, catch this show!